It has been nearly 12 years since Monsters Inc. hit theaters. It was only Pixar’s fourth film, following the first and second Toy Story movie, as well as A Bugs Life. Although Pixar didn’t seem fond sequels at first, with Cars 2 being the only exception to the rule, we are getting a Finding Nemo sequel in 2015. And we now actually have a prequel, where we find out how those lovable monsters who work on the scare floor became friends and learned how to do their job. Mike Wazowski (Billy Crystal) was never a popular kid growing up in school. He wasn’t the biggest, or the scariest monster, but he always wore a smile on his face. His class takes a field trip to Monsters Inc., and Mike learns that he wants to grow up to be a “scarer” after he sneaks into one of the rooms. One of the top workers there gives Mike his hat, with an “MU” logo on it, and told him he learned everything he knows from Monsters University. Fast forward several years, and Mike finds himself at the school for monsters. It is there that he is enrolled into the scaring program, and with none other than James P. Sullivan (John Goodman). But the two were not always friends. Mike wants to do nothing but study and ace every course, where Sully just wants to slide by – often using his famous father’s name to weasel his way out of doing any work. But when the two are threatened to be kicked out of the school by Dean Hardscrabble (Helen Mirren) the two are forced to work together, along with some new found friends. Something that all of the Disney-Pixar films have done is made themselves appealing to audiences of all ages. While you know that the target audience is children, there isn’t one of their films that I have thought doesn’t work for adults as well. There is always something thrown into them that might go right over a child’s head, but makes the film more entertaining for their parents. Monsters Inc. was a clever and charming film, and Monsters University was done in the same vein. In the first film, you are lead to believe that Mike and Sulley have always been the best of friends. The chemistry between the two characters is fantastic, and it seems that they have known each other forever. But in this prequel, we find out that the two were at odds for a good part of their first semester. 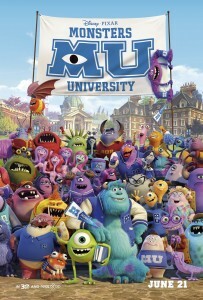 The film has a good message, showing that all of Mike’s hard work and studying pays off with good grades, where Sully’s partying and trying to slide by nearly gets him thrown out of school. There are certainly some stereotypes of fraternities that are exaggerated in the movie, but they are done in a fun way that everyone can relate too. And even they don’t put up with the monster’s poor grades. It is great to have Billy Crystal and John Goodman back for the prequel. The film wouldn’t be the same without their iconic voices, and it is a lot of fun to hear them banter back and forth – especially before they become friends. Had they not gotten the same actors, I don’t think the film would have worked as well. In general, it is hard to make a sequel as good as the original. This is especially true when it comes to these now-classic Pixar films which have scored almost perfect ratings in the eyes of the critics for the past decade. But in the case of Monsters University, it is darn close. The film has a great story, fun characters, and appeals to a wide audience. There is always enough going on to keep kids entertained, while there are small nuisances around every corner to make the adults appreciative of the Disney-Pixar magic. Monsters University is an A.